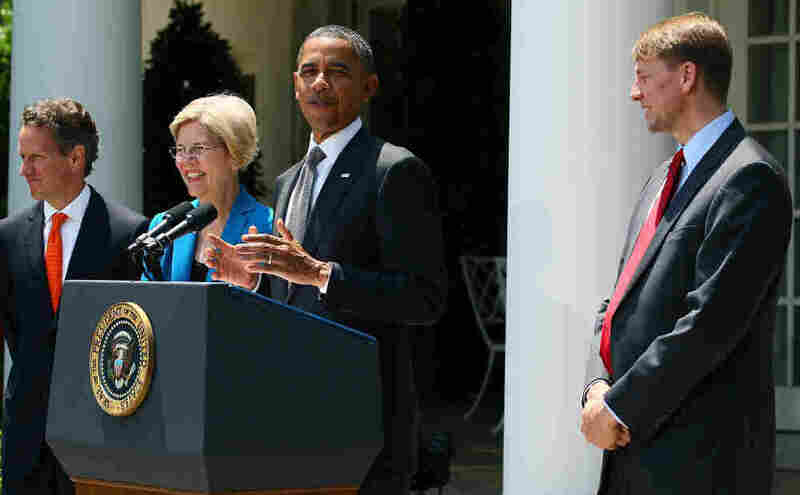 Obama Makes It Official: Cordray Not Warren As Consumer Finance Head : It's All Politics For modern presidents, there haven't been many knock-down, drag-out confirmation fights that ultimately have been worth having.And President Obama wasn't about to make Elizabeth Warren an exception to that general rule. President Obama at his announcement of Richard Cordray as his choice to lead the Consumer Financial Protection Bureau. Elizabeth Warren and Treasury Secretary Timothy Geithner also attended. For modern presidents, there haven't been many knock-down, drag-out confirmation fights that ultimately have been worth having. And President Obama wasn't about to make Elizabeth Warren an exception to that general rule. He just wasn't going to get into an overwrought, presidential election-cycle confirmation battle with Senate by naming the Harvard University law professor to be the first head of the Consumer Financial Protection Bureau. So on Monday he officially nominated Richard Cordray, a former Ohio attorney general to the post. While Warren has served as an adviser to the administration in helping to set up the new agency, Cordray has worked alongside her to establish its enforcement functions. Progressives had hoped Obama would choose Warren, a vocal consumer advocate, especially on credit issues, for the new role. But Warren has repeatedly brought out the worst in congressional Republicans who have show varying levels of hostility to her whenever she has appeared on Capitol Hill to testify about the new agency, her brainchild which was created by the Dodd-Frank financial reform law. The financial services industry has also been a Warren foe, fearing that she was less sensitive to its profit goals and engineering innovations than it would prefer in the head of the new agency. Nominating Warren would have likely led to another stalemate with congressional Republicans who could have held up her nomination indefinitely. It also would have handed the Senate GOP a ready made issue they could use in seeking campaign money from bankers in an election cycle that already poses huge challenges for Democrats trying to maintain Senate control. White House officials had signaled for months that Warren likely wouldn't get the presidential nod, so Obama's ultimate choice wasn't a surprise. On Sunday, they let it be known that it would be Cordray. Rumors have abounded that now that she didn't get the job she was known to want, Warren might challenge Republican Sen. Scott Brown for the Senate seat representing Massachusetts. Warren hasn't made any strong public statements that she's even interested in such a run but that hasn't stopped the speculation.